Below is a map of our route to date – or at least until January 2019. Every night we have been storing our exact location, as well as what type of accommodation it is. Using the fantastic what3words system (which we love, it’s great for so many reasons we only wish it was more universally implemented) each pin on the map below is the exact position where we stayed correct to a 3m x 3m square. You should be able to zoom in and click on each pin to find more information. Still a very fluid plan! Our original goal was to get to Mumbai and see the fantastic work Magic Bus does in action. 5500miles later under our own steam and we were thrilled to have made it. The problem was that we were enjoying it too much and didn’t really want to stop. Travelling by bicycle is an effort, but the rewards vastly outweigh the sweat. To that end we have decided to continue our journey, having raced (and we mean that, it’s been an absolute whistlestop tour) around north India by train and bus we will fly to Mandalay and head south through Myanmar, ideally across the top of Thailand, through Laos, down the Vietnam coast, back through Cambodia into Thailand again, and then down through Malaysia to end up in Singapore. That is the ideal plan, but we aren’t sure realistically if we will have time to all that. We want to make sure we can end up with a few months in New Zealand to explore (off the bikes) and ski before heading back to the UK by August. The original plan was as above, but due to visa problems with Iran it was not possible to achieve. Without that option, another alternative was through the ‘stans and over the famous Pamir Highway, but with it being November, and temperatures reaching -20 we felt that our 3 season sleeping bags (nod in appreciation to Open Air, Cambridge) and our dislike of frostbite meant that that too will have to wait for another year. 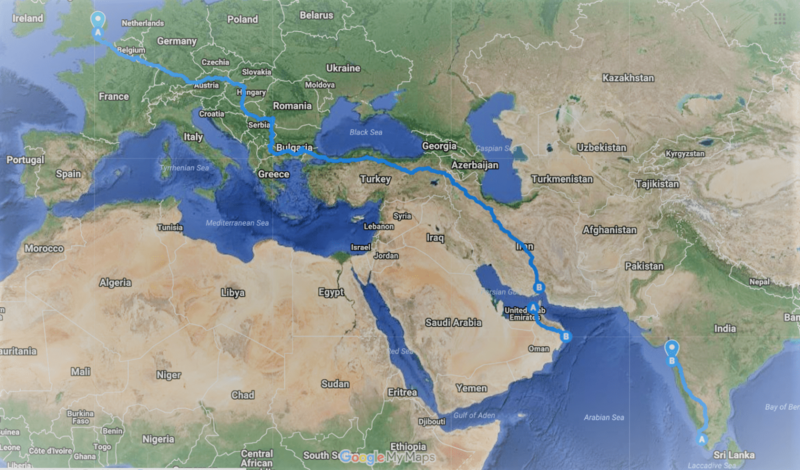 Instead we flew over Iran to Dubai and cycled further through Oman and India than we initially planned to make up some miles. If you know anyone who we could pop in and visit along the route then please let us know.